Ahh, the Cold War. A notion that I imagine sounds as foreign and 'from the past' to kids today as the Korean War did to me when I was growing up. As a kid in the '80s though, even if you were more interested in Devo and Transformers, you knew that phrase and a little bit about what it meant for you and your country. 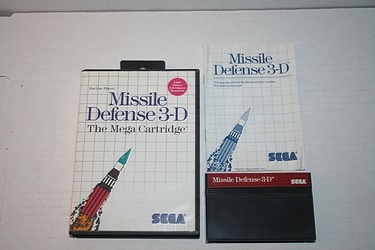 How better, then, to commemorate this great and glorious time in our nation's history than through the ultimate irony of Sega's Missile Defense 3-D! This title will be familiar to everyone as Missile Command, but you get to wear the super styling Sega 3-D goggles, always a plus! That this game about averting nuclear holocaust came out of Japan and landed on our shores should be lost on no one, though that nation seems to be the leading proponent of the ability to forgive and forget - or perhaps time healing all wounds, or maybe just loving the 1980s culture of the U.S. so very much that they just couldn't help themselves. Whatever the case may be, click on the image above for some more images of this Sega set, and to read up on the details in the instructions! The sub-text of that last header? "The war won't end until both sides run out of missiles." Well, that's sort of true...!